SEO, SEM, Facebook Ads, content marketing, affiliates, partnerships, email marketing, app stores…the list goes on. There are a lot of distribution channels to choose from. New ones are emerging. Existing ones are always changing. The questions, "Where do I start?" and "What do I do next" are common ones. The information can be overwhelming. Here is a step by step guide that should help you go through the exercise of comparing, contrasting, and choosing the right marketing channel for your company. I have used my last company, Boundless, as an example to help illustrate some of the steps. For context, Boundless provides a free digital alternative to college students’ crazy expensive textbooks. Step 1: What Are You Optimizing For? The first question to ask within your user acquisition efforts is “What am I optimizing for?” In addition, why? This question will help set the broader context for your acquisition efforts. Learning - You might be trying to learn something specific about engagement, interest among a certain target audience, monetization ,etc. Learning is typically the priority when your startup is pre product-market fit or when you are expanding to a new target audience. Volume - There will be a time in your business when you will want to prove that you can go from a certain base amount of customers, to moving the needle in a meaningful way. Volume may also be the priority if you need a minimum amount of users/data to reach some broader goal. Cost - Optimizing your CPA to get more out of your budget. Want to optimize for all of them at once? When you focus on everything, you have no focus. Not having a focus will lead to mediocre results. Make the tough decision about what is most important. At the beginning of Boundless, we had a lot more questions than we had answers. Would students ditch their assigned textbook and use a digital alternative? How often did they use their textbook? These questions challenged the fundamental assumptions about the business. Those questions could be translated to questions about engagement, retention, referral….things deep in the user funnel. Step 2: What are your constraints? Time - Do you have a specific optimal window to reach your audience? Do you only have 3 months of cash left? Money - Are you well funded, or bootstrapping? Do you need to extend your runway? Target Audience - Do you need to reach someone really specific? At Boundless we were well funded (yet diligent with our money) and as a result money was not our largest constraint. Our constraints came in target audience and timing. We were trying to reach college students in very specific classes (Intro courses for Biology, Economics, and Psychology) within a two week optimal window (the beginning of the semester). SEO, SEM, viral, display, social, Facebook ads, mobile ads, affiliates, content Marketing, sales, etc. List all of the possibilities in the header column. (for simplification I have only listed a few below). Don’t forget about all of the alternative channels out there. StumbleUpon, Reddit, Twitter Ads, email sponsorships, podcast sponsorships, blog sponsorships, PR, app stores, etc. While these channels don’t provide scale, they may provide opportunity to help you get traction. Certain channels can be broken down into more detailed tactics. For example, content marketing could be broken down into blogging, guest blogging, info graphics, webinars, ebook, etc. SEO can be broken down into head, mid tail, long tail. I like to get as specific as possible. Start with the high level channel, and then break down the tactics as you get to steps 4 and 5 when you are narrowing down your options. Targeting - The depth of ability to target different audiences. Cost - The upfront and ongoing cost to acquire users in this channel. Input Time - The upfront time required to start running experiments with this channel. Output Time - The time it takes to start getting data around your experiments. Control - The control you have over turning the channel on/off at will. Scale - The size/reach of the channel. The next step is to research each channel so you can fill in each cell with “low”, “med”, or “high” values. You aren’t trying to predict exact values. Get enough information to make educated comparisons of each channel relative to each other. 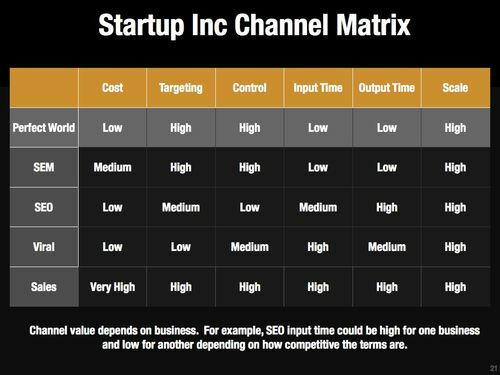 The matrix looks very different for different companies. For example, “Low” will mean different things to different companies (i.e. A enterprise SaaS company with a high LTV vs a consumer mobile app monetizing with ads). A help desk SaaS tool may have the value of “low” in the “Scale + Google Adwords” cell. There are a small amount of head terms that get limited traffic. But for a a travel review site, the cell “Scale - Google Adwords” might be high because there is a large amount of long tail terms which collectively have a huge amount of traffic. Are there upfront costs? Minimum spends? Pay as you go? Incremental cost (i.e. expected CPC’s or CPM’s)? For example, a blog sponsorship might cost $1000 upfront before you get any results. Where as Facebook Ads you can get started with as little as $10. How much time is required to get to the first experiment? How much time to run each additional experiment? Is there any technical work involved to get started? Creative/content creation? A channel like Google Adwords has a really low input time. No tech involved. Keyword research, ad creation, and landing page creation can be done in less than a day. Compare this to content marketing where creation of one high quality piece of content and finding a way to distribute from a cold start could take much longer. How much time will it take to start getting results? How many experiments do we have to run to get meaningful data? Once again, something like Google Adwords has a really low output time. You start getting results immediately. Can you turn the channel on and off at will? Is there a middleman between you and the knobs you can turn? For example, PR is really low control. You can’t just turn it on and off at will. A lot is in the hands of others (the writers). Where as Facebook Ads you can turn on and off whenever you want. More control means it is easier and faster to run experiments. How large is the channel in overall volume? How scaleable is it in terms of your time/resources? Most major channels have research tools dedicated to them. Google Keyword Tool (SEM), SEMrush (all PPC), SEOmoz (SEO), MixRank (Display), just to name a few. In addition use the tools provided by channels (i.e. Facebook Ad Tool, LinkedIN Ad Tool) to help estimate things like cost/scale. I get some of my best information just by talking to others that have experimented with the channel. All it requires is a 10 minute conversation and the right questions to uncover information that can help educate you on the channel. For channels like blog sponsorships, use Google to search for how many blogs there are for your target audience, how big they are, if they already do sponsorships, and if they have publicly available ad rates. You will rarely get a channel that fits those values perfectly so the question is how do you prioritize? This is where the work you put into Step 1 and Step 2 come in. Sort your channels using your constraints as a guide. If your biggest constraint is money, then look at channels that have a low cost as first priority and come closest to the ideal values for the other attributes. Lets revisit the Boundless example. Our constraints were time and targeting and we were optimizing for learning. 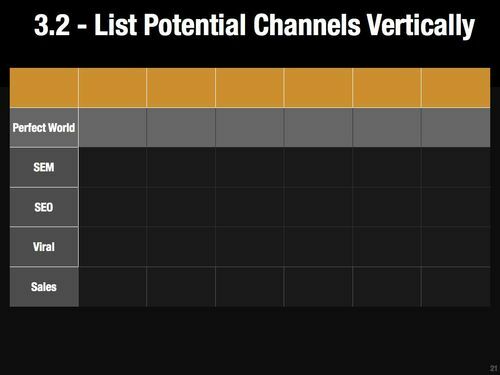 As a result we looked for channels that were high in targeting, low in input/output time, and provided just enough scale to get us the data we needed. Ultimately we settled on Google Adwords. While we knew the cost was going to be higher than other channels, it offered the exact targeting we needed (students searching for class materials for the specific classes that we were targeting) and the low input/output time that allowed us to setup, test, and change quickly during our two week optimal window. We knew we wouldn’t scale the company with Adwords, but it provided enough volume to reach the level of data we needed to learn about some of the fundamental assumptions around our businesses. This is only the beginning. At this point you have a hypothesis about a a customer acquisition channel. You need to set up and run a number of experiments to prove out the viability of the channel in relation to your goals. In a future blog post I will tell you how to brainstorm, setup, and run these experiments to optimize your success. I hope you found this post helpful. Subscribe to my email list to get early access to my posts. Or follow me on Twitter to get articles I’m reading about Growth. I’ll be answering comments here on hacker news.